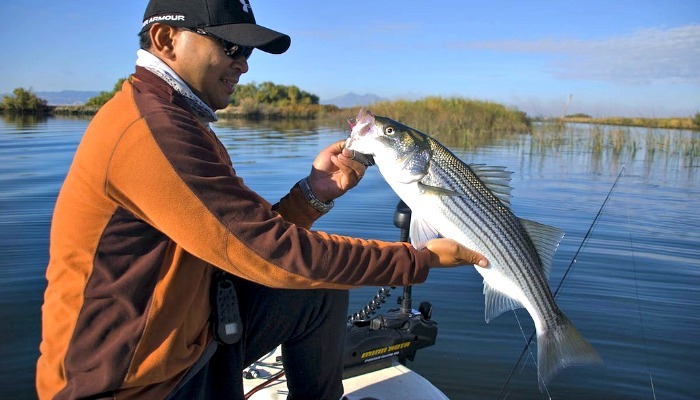 We have compiled a few of the best striper fishing tips which we feel are the most important to help improve your ability and chances of catching these seemingly elusive predators. Striped bass can be caught using a variety of methods, in freshwater and saltwater. However, stripers aren't always as predictable as we would like them to be. The following is a quick list of tips that you should be able to benefit from. Just keep them in mind the next time you head out to the water. Or jot down a few of the key notes, take a snap shot if you're on your mobile device, or print this page if you prefer to. best times to fish for stripers are dusk, dawn and throughout the night. These are just a few generalized striped bass fishing tips that we give the pleasure of providing. There is quite a bit more to learn as you gain a better understanding for catching these beautiful creatures, including the proper striped bass techniques and methods that work best. There really isn't any substitute for the valuable time you spend on the water. This, in turn, will allow you to gain the necessary experience and knowledge to have many more productive outings. You may also want to check out our other articles to learn more about striped bass fishing. Feel free to share your comments in the facebook commenting section below at the end of this article, or you can choose to submit your fishing tips here. And please be sure to share your striper fishing pictures and check out the photos and stories that other striped bass fishing enthusiasts have submitted.